Do you want to try our bacon, but don't have the patience to wait for delicious bacon to be delivered to your door every month? With this 5 Pack Bacon Sampler, you'll get 5 different gourmet bacons that are featured in our Bacon of The Month Club shipments. We'll send all 5 packages in one shipment so that you can pig out immediately! 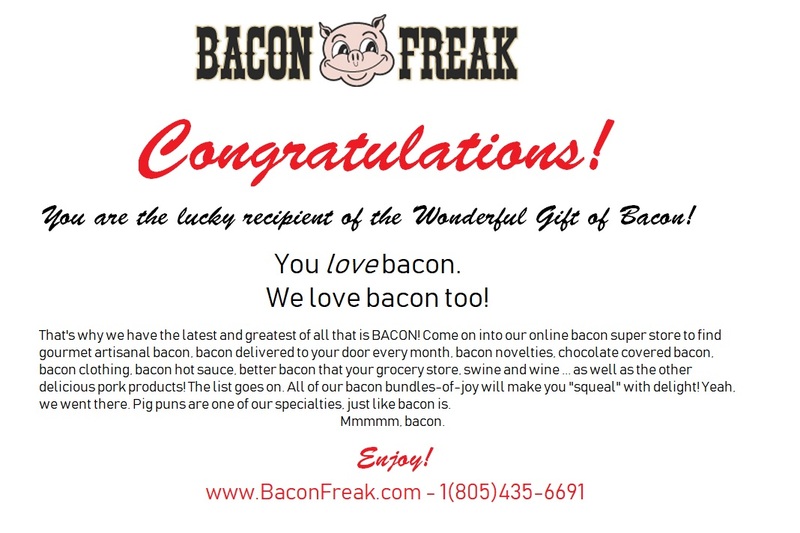 Our samplers are packaged in our playfully designed Bacon Freak Gift Box, which makes this item the perfect gift for you or any bacon lover in your life. Go on, admit that you're a Bacon Freak piggy! This was purchased as a Christmas gift. Sparked a flurry of excitement and a purchase by my niece for her boyfriend's family! This is a pretty sweet deal compared to buying it separately. This was a gift for my father-in-law and he loved it, said the bacon was the best he's had! this was a gift for my brother. this was a gift for my brother. He did e mail me saying he got it and it smelled FANTASTIC.